Posted on August 16, 2016 at 11:31 am. 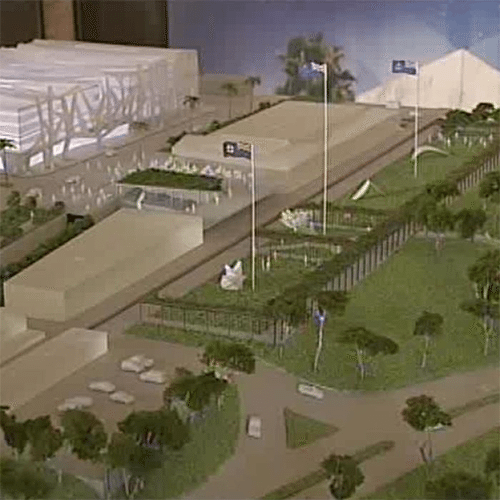 An artist’s impression of the proposed development – which includes a casino – in Mildura. It would be Victoria’s second casino, with Crown Casino, Melbourne, the first. A BOLD new plan to build a casino in the rural Victorian town of Mildura could be in the works if developer Australian Cove Limited can win over the public. The plans – simply known as ‘The Mildura’ – would see a $300 million dollar convention centre, a five-star hotel and a casino built in the north eastern Victorian town, home to over 50,000 people. Australia Cove chief executive Bob McIver believes the project will “make a statement” but still needed public support to get under way. “The starting point needs to be full support from the Mildura community,” he said. Despite the Australia Cove confidence, the state government has given no indication they are willing to issue a second Victorian casino license. Previous failed attempts to get a second Victorian casino built – including a 2011 bid to bring a similar project to Mildura – could be attributed to ill-conceived approaches to getting the vision off the ground. “Other projects that have been mooted probably had an incorrect strategy for success,” McIver said. “For instance I’ve been involved with projects of this type since the early 1970s, which included building the Yulara Tourist Resort at Ayers Rock, so we know what we are doing. Over 140 people attended the August 10 launch, which is projected to generate 800 building and construction jobs and a further 800 ongoing positions within the facility. Mildura Development Corporation chairman Jenny Grigg said ‘The Mildura’ had the capacity to put the town on the map. “The potential is to provide our young people with new and exciting career paths, not just provide them with a job but new career paths and take them into a productive future,” she said. Ms Grigg believes small businesses in the area will get behind the project once they are acutely aware of the benefits the facility could potentially bring. “Every small business has an opportunity and should be looking at how they can complement that, how can the convention centre support what they do now, and how can they be part of that and grow their business,” she said. Despite the apparent consensus that the casino will greatly advantage Mildura going forward, not everyone in convinced. Reverend Canon Dale Barclay, from the Anglican Parish of Sunraysia South was one such resident who raised concerns, saying the project is not in the best interests of the town. “I ask the questions about what percentage of revenue would be from the casino and they were unable to answer that question. That is the real question – how big an impact will the casino have in the area,” he said. Reverend Barclay’s believes the addition of a casino would be detrimental to Mildura. “The main concern I have after the meeting is that none of that information had been looked at as far as I could tell,” he said. “No one, as far as I know, had done any work on the social impacts and I was surprised that people were supporting it without a preliminary social study being done. Crown Resorts Australia recently posted a $3.23 billion profit from its local casinos, a rise of 0.8 per cent on the previous financial year – but whether Australian Cove gets a chance for such figures of its own is still up to the community. In other news, anti-pokies campaigners are calling for the AFL to boycott the pokies and any and all future projects aiming to bring more EGMs to Australians. Top-rated online casino sites are available for players from United States. Our current #1 recommendation is Raging Bull Casino, hosting some of the best real money slots and table games available on the Web.